New Concepts in Commerce, 3rd Edition eBookPLUS (Online Purchase) follows highly successful earlier editions in addressing Commerce teachers’ needs. It provides engaging, up-to-date and detailed content suitable for a range of student abilities. The fully revised third edition covers the four core and eleven option topics from the Years 7 to 10 Commerce syllabus in New South Wales. 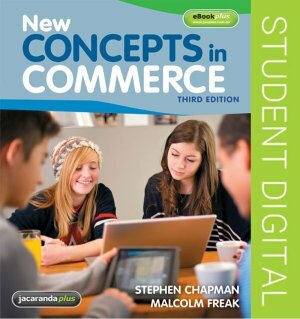 New Concepts in Commerce 3E eBookPLUS is an electronic version of the textbook and a complementary set of targeted digital resources. These flexible and engaging ICT activities are available online at the JacarandaPLUS website (www.jacplus.com.au).